Gates & Sons Bar-B-Q on State Line Road in Leawood, Kansas has little changed over the years. 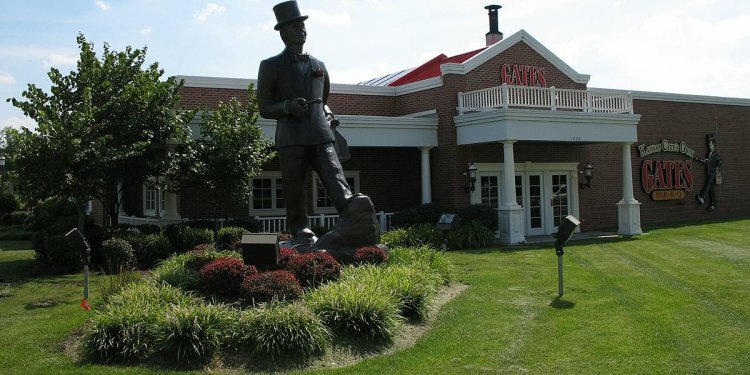 Gates is an old Kansas City, Missouri BBQ chain with 6 locations in the metro area, including this one off I-435 and one in Kansas City, Kansas. The counter where food is ordered forms a "T" with cash registers to each side, and shortly after getting in line, you hear a shouted "Hi, may I help you?" It can still be a long time before the people in front of you get their food and you are served, but at least you are greeted right away. The menu on Gates' wall isn't very easy to use. When it lists the dishes, it doesn't list sides or explain what sides or choice comes with them. The sides are on a different board. It usually quite loud in this restaurant and new customers can have a hard time finding out the details and ordering. My favorite dish at Gates Bar-B-Q has always been the Combination plate - three ribs, beef brisket, ham, French fries, bread and pickles. The price has crept up to $21, 25. It is really too much meat for one person, but no smaller combination meals are offered. All three meats are good. I usually think that Gates Brisket is the real standout item, with good flavor, appearance and texture, but on my most recent visit, the ribs were so good that I wished I had just ordered them.. Gates uses hickory in the smoking process and all of the meats have a smoky flavor. I am not normally a big fan of BBQ ham, but Gates' ham is a little thicker sliced and tastes great. The regular sauce is pretty spicy, and served heavily covering the meat. I recommend that first time diners order the meat dry so they can select which sauce they prefer and how much to use. The French fries are thick like a steak fries. They are not freshly cut or cooked as crispy as I like. They have definitely been the weak part of the meal. The first Gates BBQ restaurant was opened at 19th & Vine in Kansas City, Missouri in 1946, and Gates BBQ sauces have been available in regional grocery stores since 1975. There are four varieties, all vinegar and molasses based. Gates barbecue seasoning dry rubs were added to the lineup later.